Welcome back to this weeks Sunday night CASEing the CATTY bloghop. 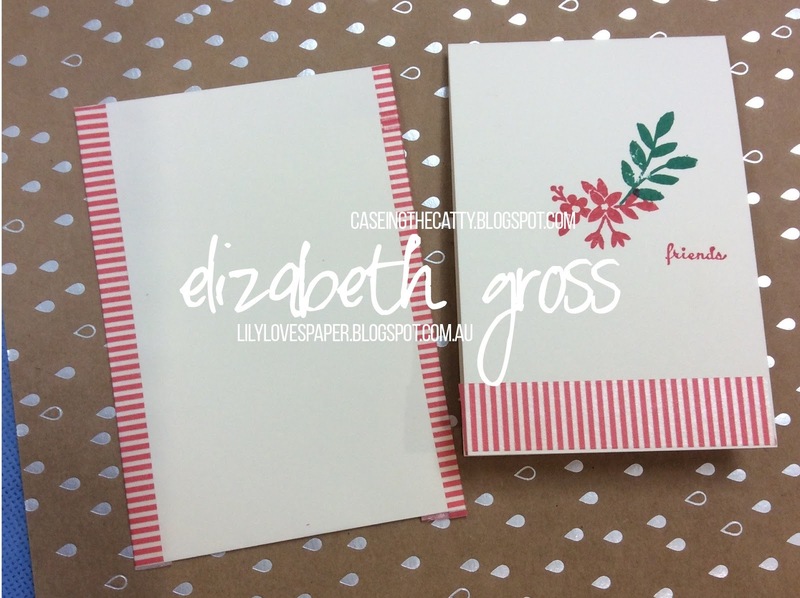 This week we are looking at Love & Sympathy cards and projects on pages 44-55. 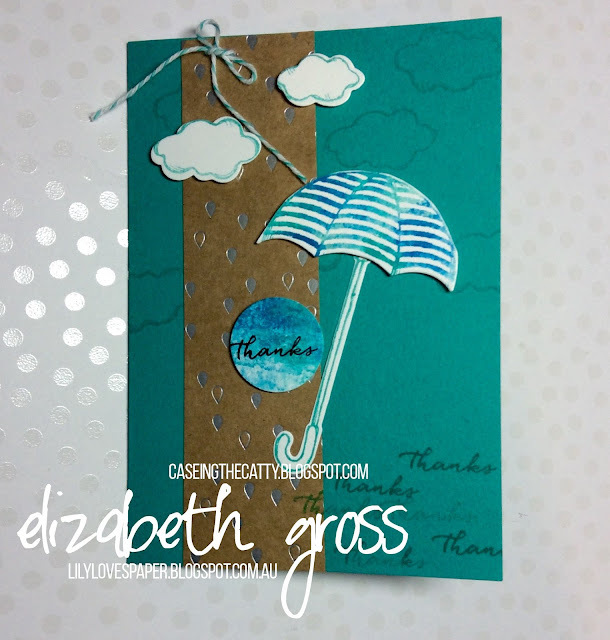 I have chosen the cute card on page 54 using the super sweet Weather Together Bundle. Today we did the baby wipe technique in class so I made this card using Bermuda Bay, Tempting Turquoise, Pool Party and Pacific Point inks. 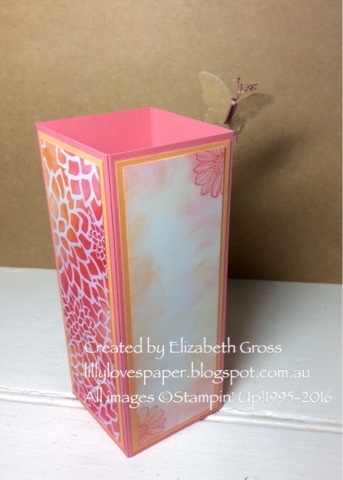 The variegation in the colours is a really nice effect and works well with stamps of a medium size. Although it works best with solid image stamps I was really pleased with this line image version. 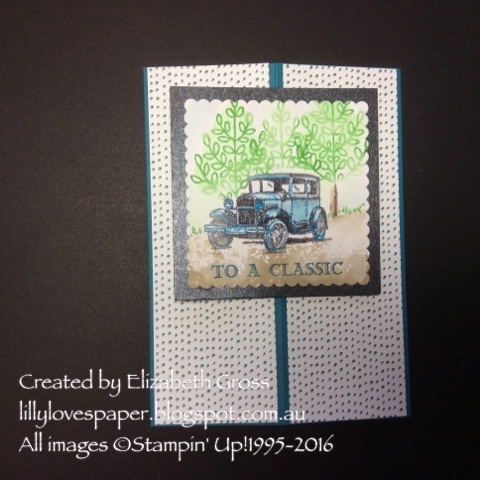 To create a solid patch of colour to stamp the sentiment stamp I simply used one of the larger stamps from Timeless Texture stamped repeatedly to cover a small area. I used a scrap of the retired Kraft and Silver DSP which already has the raindrops on it - see if you can spot my mistake here! But I did a second version using the hearts as rain - since the theme is Love! This is more closely aligned with the sample using a white panel. The solid image stamp here is the heart from the Scenic Sayings Set. 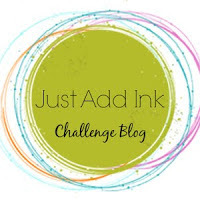 One tip I have for you today relates to rubber stamps. When you get your next set keep the background red rubber sheet and cut the largest solid piece you can from it. If you have an old wooden block lying around mount it on this and then you can use it to stamp solid areas. It is also a really useful tool for creating a smooth coloured background similar to sponging. You can see my stamp in the second photo. I have used this to colour in the clouds after I cut them out. 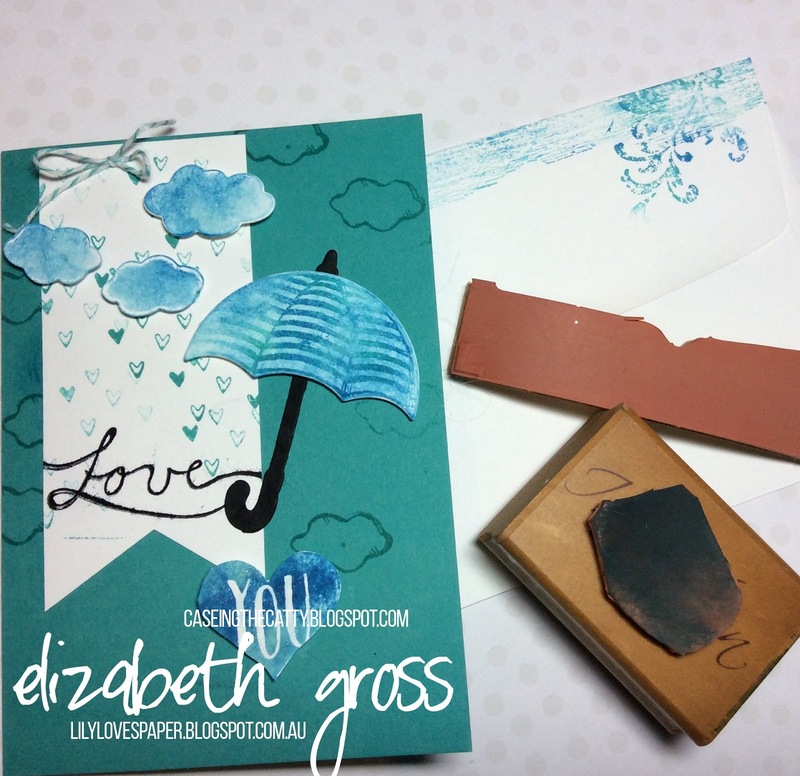 I used my baby wipe inkpad to ink up the stamp, then stamped it in a circular smooth motion over the shape (use like sponging) And also to "fill in" some background colour over the lines in the brolly. Also when your baby wipe pad is nearly faded, use it with a texture stamp to create a coloured border on the edge of your envelope. - I know we all don't like to waste anything!!!! I hope you find some useful tips here. 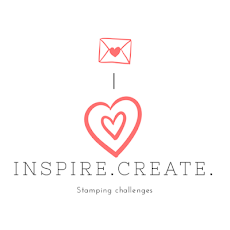 Thanks for looking tonight and don't forget we love to see what you create also. 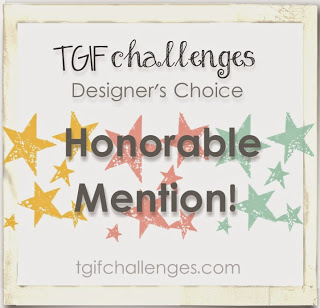 Add your project from any of the challenges on this month. Next on the hop tonight is the fabulous Bronwyn, so check out her amazing project. Love you Lots so cute! 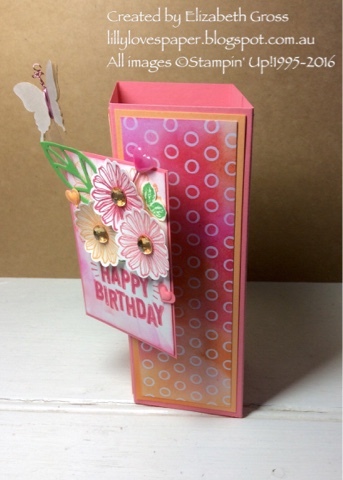 This gorgeous card was made by my friend Heather. 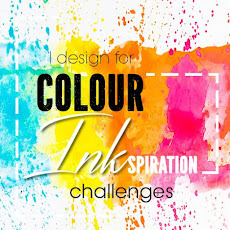 She has such a talent for colouring and she wanted to share this card with the CTC Challenge this week but since she doesn't currently have a blog I'm posting it for her. I think I need to throw a party so I can get this gorgeous Hostess Set. Thank You Heather for sharing and inspiring! Pretty pink standup corner box cards for the Handmade Expo Markets. 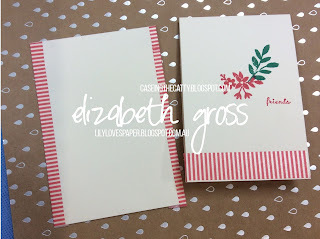 So I do really love a card that sits up or has a fancy you fold, and this design is super simple and ever so effective. I have seen it before but it surfaced again recently on the GDP challenge which I follow avidly ( though I seldom get a chance to enter despite my best intentions). 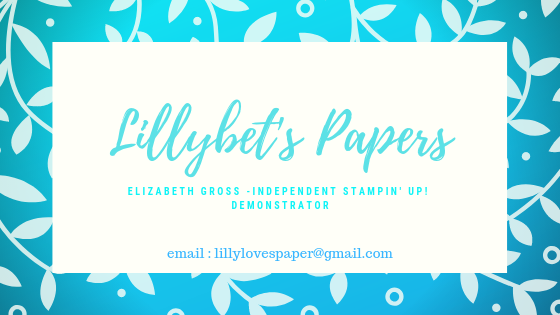 This is a simple card which folds flat for postage, and I will have a whole stash of them at the Rockhampton Handmade Expo Markets markets next week . I will also be running a class to make this later in the year. 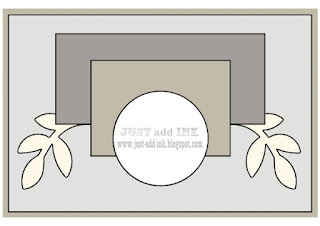 With the cardstock sitting Landscape in your scorer, score at 5.5cm, 11cm, 16.cm and 23cm. 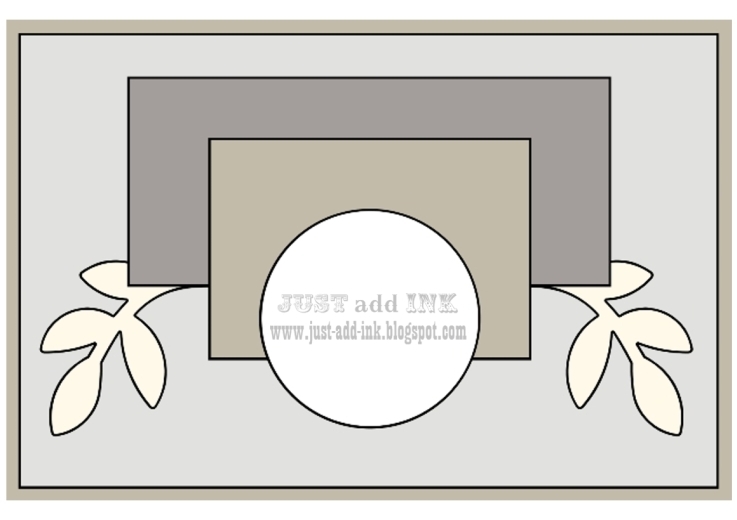 fold along crease lines and adhere 3cm flap behind one panel to make your box. on the front glue one half of each circle either side of your centre fold, the other free half of the circle is your anchor point for the front panel. So I guess it's easier to see, so here are a few photos from construction. 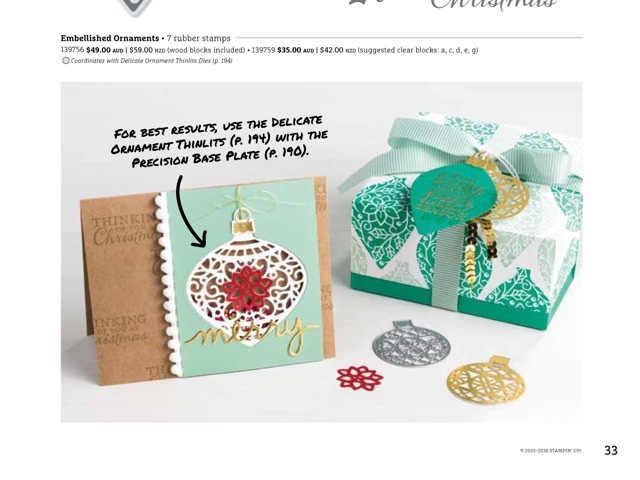 decorate - then write and post to your friend!!!!! More samples to follow. Keep an eye out! 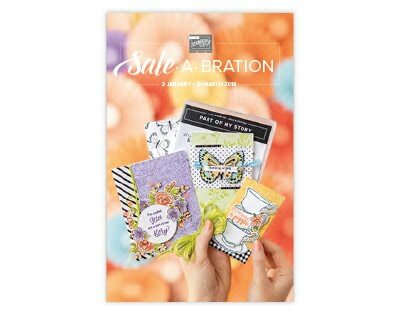 How cute are these stamped images and sentiments? I have a selection of these available at the Handmade Expo Markets this weekend. These stand up cards fold flat for posting. I will have a tutorial on these soon, but it too is still under construction!! 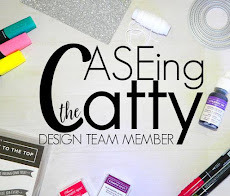 Welcome ro the Sunday night CASEing the Catty blog hop. This week we are taking inspiration from the Chapter on Thanks, pages 38-43 in the Catalogue. You may have come from jackie or you may be starting here. 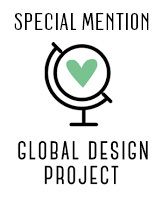 We hope you find something to inspire you in these projects. 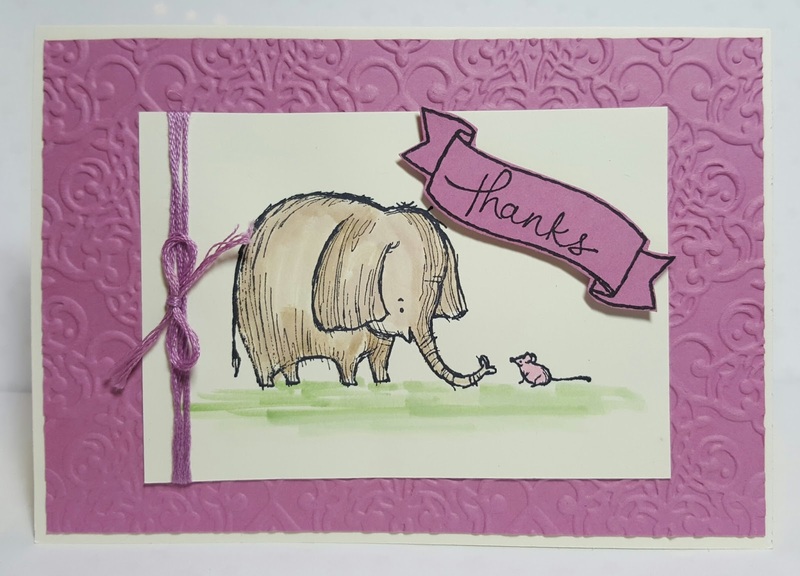 There are so many ways to say thankyou, but I don't think we send cards nearly as often as we should. 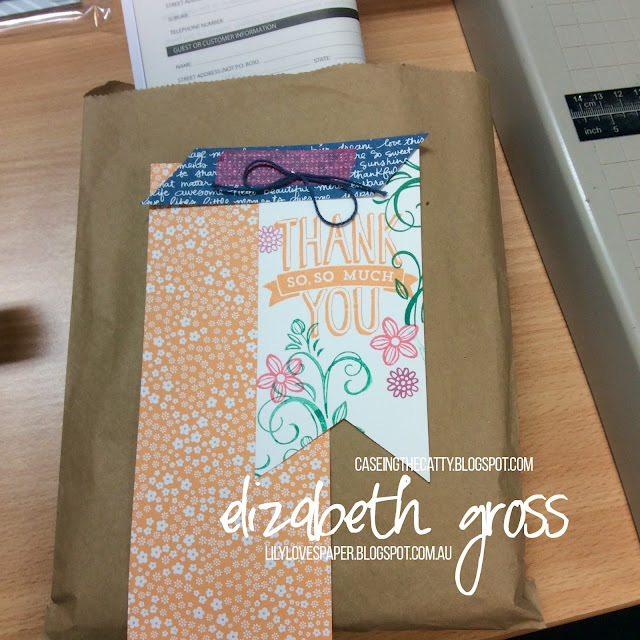 I feel I have so much to be grateful for so I love to send Thankyou notes. 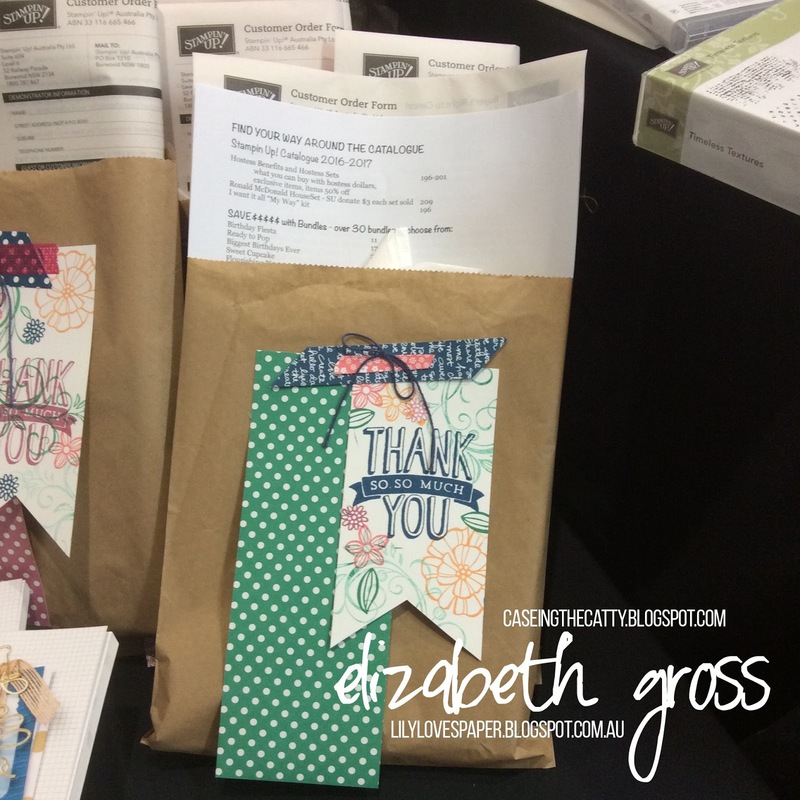 However, for this week I took inspiration from the fabulous packet on page 43, and I used this a model for my Welcome Package at my Catalogue Launch Party today. I had a lot of fun playing with the fabulous new set Falling Flowers. It has some really great images in it and I have had a bit of a play with it this week. (You can see some other samples with them Here and here) There are matching framelits too which make life really easy but for these I just did some random collage stamping on the tags. The bags displayed various In-colour DSP papers and the new Navy Solid Baker's Twine - which comes in a spool like the thick twine but is only as heavy as the 2 tone regular twine. The paper was only adhered with a strip if sticky strip and a staple at the top so they got a sample piece of paper to take home. And details of how to order in a shopping emergency. 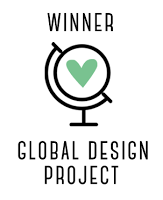 Don't forget we would love to see what you create too, and we are looking for new design team members at the end of this months contributions. So go ahead and link up with us. 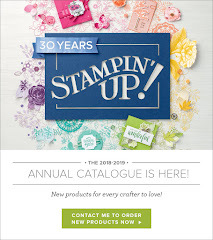 While this card is made with not all Stampin' Up! products it is a blend of old and new, nothing borrowed but something blue. 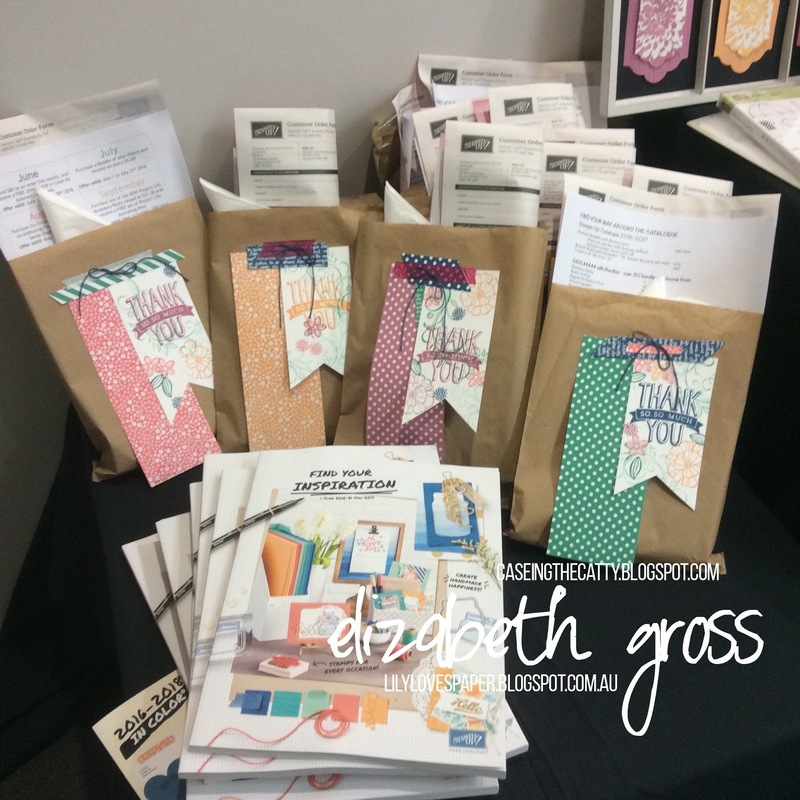 Next weekend is the Handmade Expo Markets here in Rockhampton and I always like to have a stash of wedding cards. This is one which I think fits the bill for both these challenges. 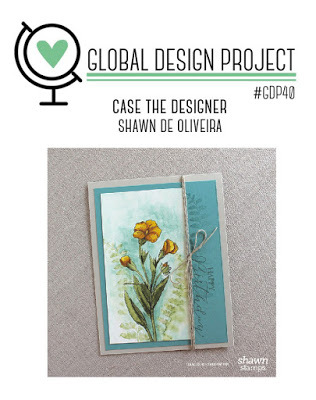 The GDP challenge #040 is to CASE the Designer and using Shawn de Oliveira's card I have reversed the layout to have the long strip and ribbon accent on the left. I am really glad I purchased the new Falling Flowers and May Flowers bundle. The stamped images are crisp and clear and the framelits are magic. 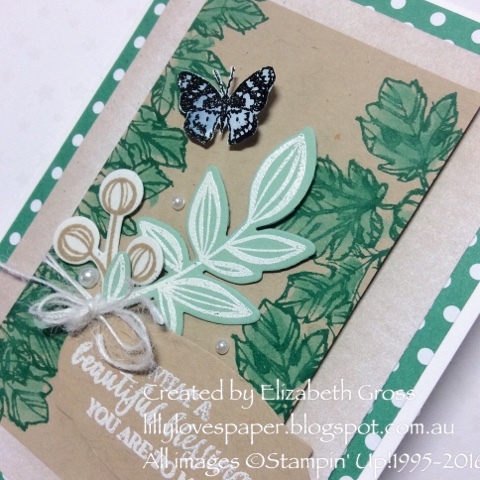 I have heat embossed in white both the leaves and berries onto Naturals White cardstock (wish they'd bring this back), and also one onto some pale DSP which I had left over. Then I coloured the berries with my blender pen using Mint Macaron. 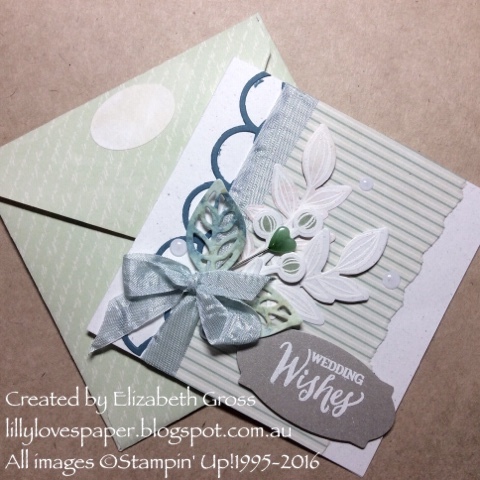 The die cut leaves are from the same set of framelits and I used some shimmer white paper which I had watercoloured for another project. - don't you get a sense of satisfaction from using up scraps and leftovers - handy for those of us who struggle to throw anything away... I know I'm not alone here!! 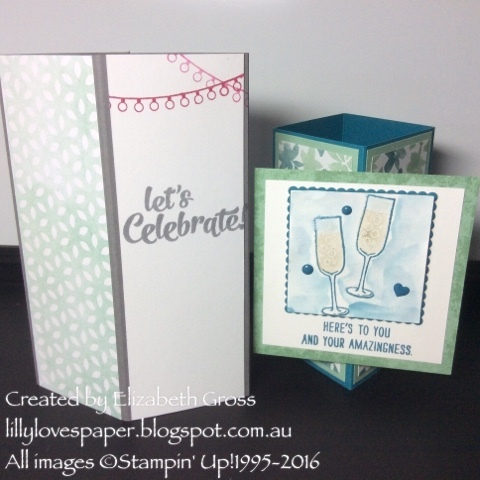 The white accents are stamping up as is the seam binding and the scalloped thinlits die (sadly retired), and the Wedding Wishes is from the Rose Wonder set which has the most gorgeous fonts and sentiments - and framelits to match for a bonus. As always I make a matching envelope and this is retired DSP from Venetian Romance - somehow apt for a wedding card don't you think? 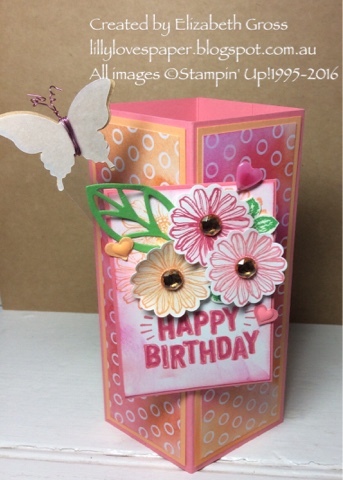 I have made a few other cards using the Falling flowers and May flowers sets which are posted this week on this blog if you would like a few more ideas on how to use this set. Don't you just love it when a card comes together quickly without too much rearranging? I have been working very hard to clear a lot of thos 'bits and pieces' off my work area. I am a bit of a chaotic crafter and always end up with extra bits left over from projects - which I struggle to throw away.!!!! So this card actually used up 8 elements ( including a stamped envelope) which were left over from other projects and it all just fell together. I am really glad I purchases the Falling Flowers set as it is truly lovely - nicer than the catalogue would suggest. I hope you get a chance to play with it sometime. the matching Framelits are brilliant, especially the large Dahlia, and I'll have more fancy fold cards to show you this week using it too. Having said that, this set would work well as just the stamps on their own. 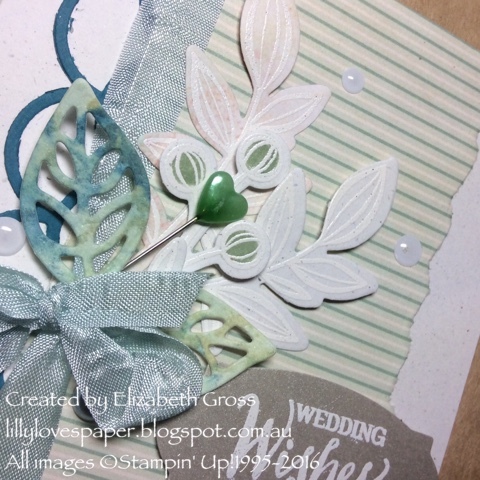 I do love the leaves from the Fabulous Flora set stamped along the edge of the card like this. It's a technique I used a lot for Onstage. they are then painted with the Aqua Painter. and I have a special friend in mind for this card too which is even better. 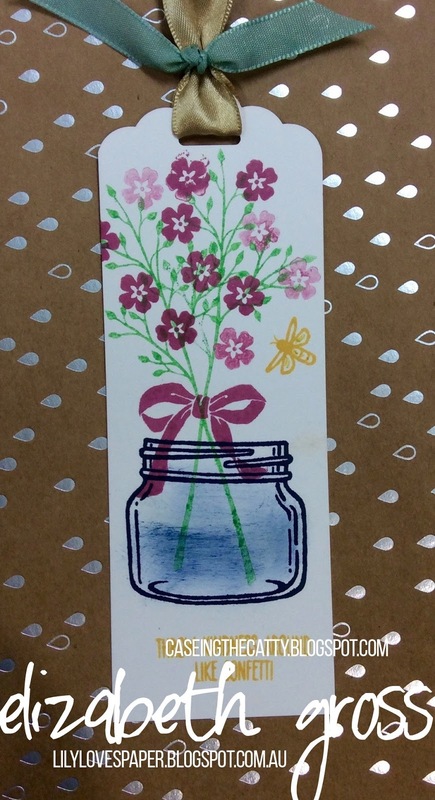 Inlaid Diecut Technique using May Flowers -another shaker! Well my new products arrived and this is what I had in mind for last weeks CASEing the Catty entry. but this brilliant flower die is so much more satisfying! The other framelits in this set are gorgeous too- leaves and berries and lots of flowers. I love the Mint Macaron with the Sweet Sugarplum and Sahara Sand (colours inspired by the Blooms and Bliss DSP ). That cute border and the sentiment is from the Tin of Cards Stamp set - so versatile. Other fabulous products - the new Mint Macaron Sheer Linen ribbon, Blushing Bride sequins and Metal Rimmed Pearls. Who doesn't love a shaker! 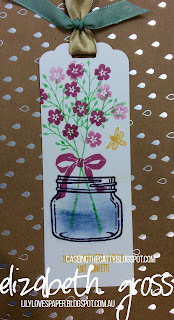 Thanks for looking, I have one more project to share using the May Flowers Thinlits tomorrow. 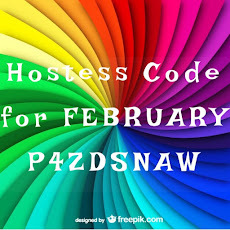 Just a quick post as I rush to get in before the deadline!! 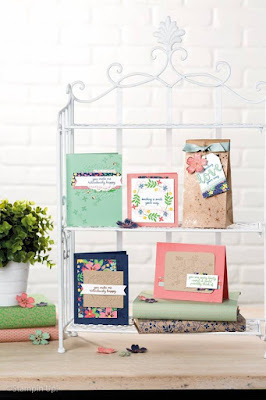 I have finally had some time to play with some of my new products from the new Catalogue, and I'm loving the new May Flowers Framelits and the matching stampset Falling Flowers. The new DSP Blooms and Bliss was the inspiration for my colour palette of Sahara Sand, Mint Macaron and Rich Razzleberry. And how could I not use the beautiful Copper Embossing Powder. For the smaller panel behind the focus flowers I used another new product - the Petal Burst embossing folder. I'm glad the silver rimmed pearls have carried over this year, they are an easy accent. Thanks for looking, I have some other projects to share next using some more of the Framelits, they are really stunning. CTC82 Christmas inspired but not for christmas!! Pink Shaker. You may have arrived from Bec, or you may be staring here, but jump in here and follow around the group. Well I don't know about you but I can't possibly think about making Christmas projects yet!!! But that's quite OK because the idea of CTC is to use the catalogue as a springboard. Now I did have plans of using a new detailed thinlit but sadly it didn't arrive today so I did a quick rethink, and I still managed to use a few new products. This technique is an inlaid diecut technique so I first cut the word from Pink Pirouette, and then a second time from the Flirty Flamingo piece. I was very careful when pulling the words out so that there were no tears or crinkles in either piece. The die brush was really helpful but I used it very gently so as not to warp the Flamingo background piece. I could then easily place the light pink into the dark background piece. 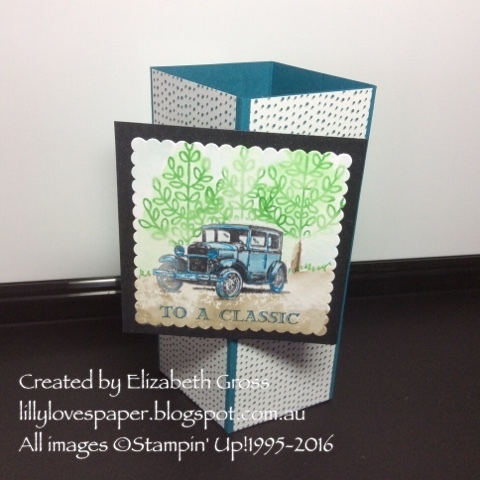 Initially I had planned to fill in the gap with the dark pieces but then I had a little idea to create a shaker card. It's not a very big window but I have been keen to try out the new foam strips so this was a good chance. They are amazingly easy to work with. If you don't have any yet you NEED to add them to your shopping list! I used blushing bride sequins inside the shaker but I also added some non SU glitter. I tried to splatter some clear wink of Stella but I haven't really mastered that technique yet, however I am really happy with the new enamel shapes in the current In Colours. 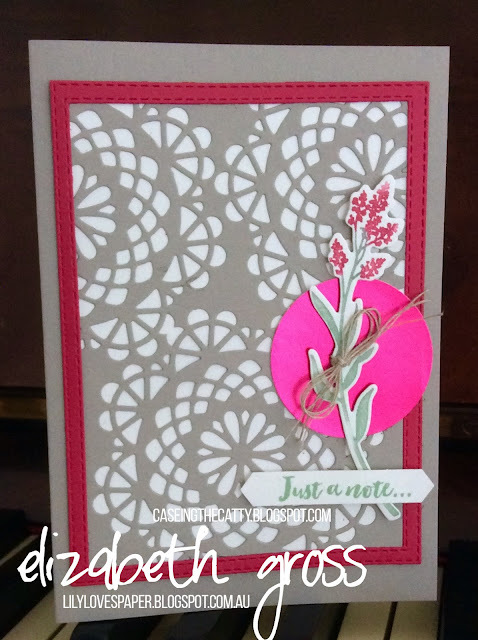 Instead of the white Pom Pom trim I used a few strips of the new Irresistibly Floral DSP and sponged it with the Pink Pirouette ink. 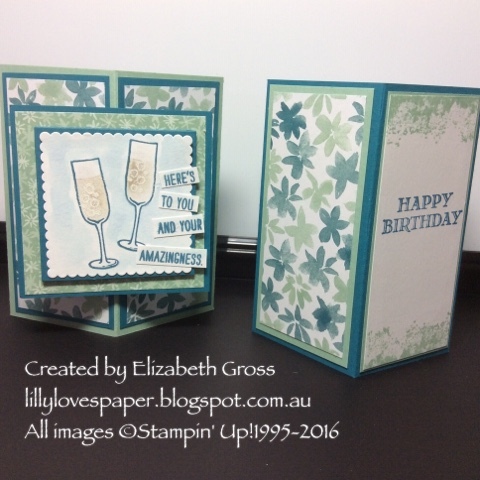 I LOVE is paper and have a few other samples made up with it which I will post later this week. This was not a difficult card to make and I was under the pump to get it created in a short period of time. I made it in 20 minutes which is what is so great about using the catalogue for ideas. The layout and ideas are already there. 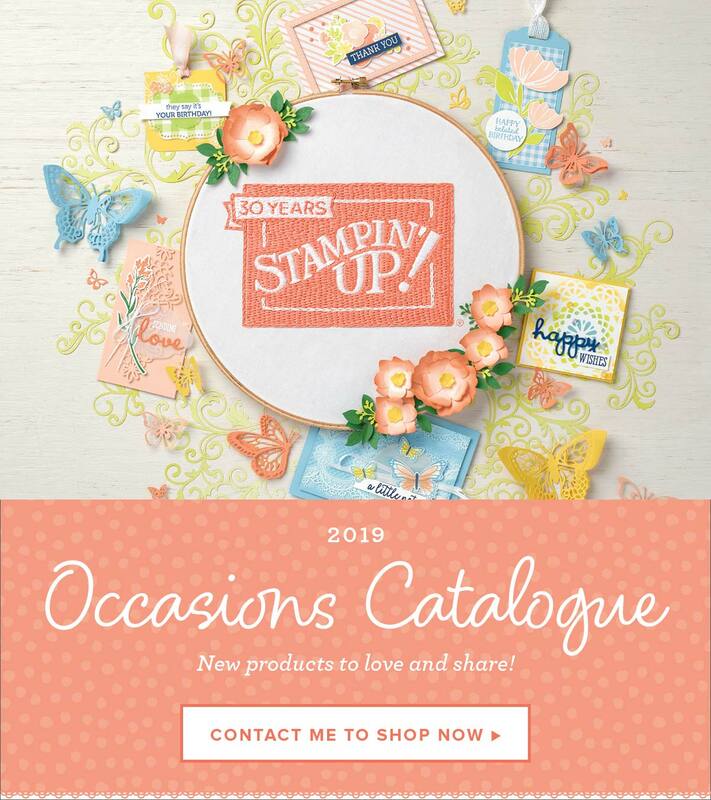 I would encourage you to look at all the catalogue samples closely and see what grabs you the first time and recreate it with your own stamps and colours. Then we'd love to see your creations, so join in our monthly challenges. Copy and Share that's what we're all about. 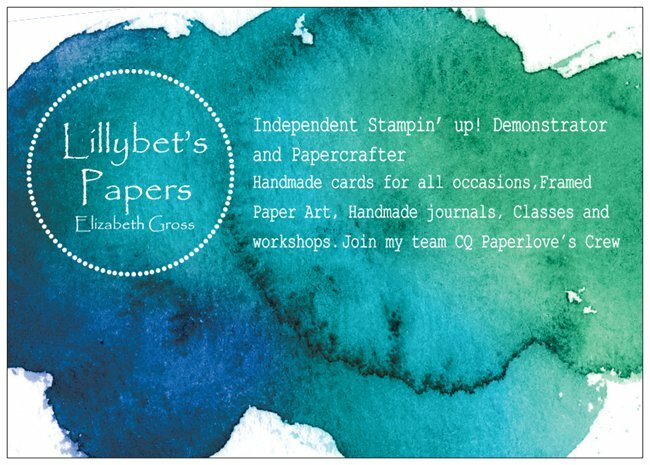 And this month we are looking for any interested crafters who may want to join our Design Team. You'll need to link a current project to our challenge, need to be a Current Demo in Australia or NZ, and need to blog regularly. You can email any of us for more details. 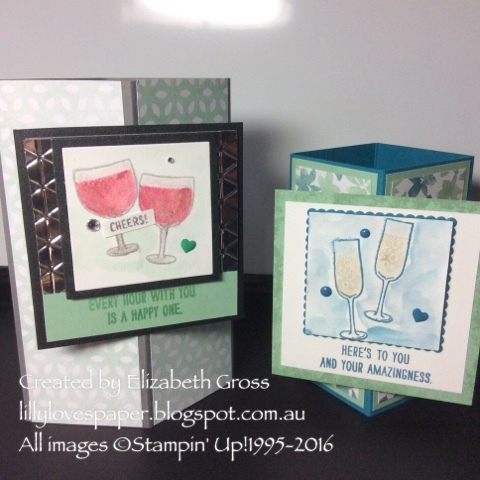 Next on the hop this week is Simone, check out her fabulous creations too.